I 've been thinking of organizing my recipe collection for quite a while. Due to immense support and inspiration from my family and friends I decided to settle on a food blog. And here comes my first post and the launch of my tiny space on the blog-sphere. I remember making Omelet with my brother, which was one of the basic things I knew during my college days. He used to whisk the egg and I used to chop the onions. We used to add fresh grated coconut to it which gives a wonderful crunch to the omelet. Grabbing hand full of coconut from the plate when Mom grates it, was a fun activity for me and my brother. Being a working mom, its really like running a Marathon from Monday through Friday for me to pack lunch and make a quick and healthy breakfast for kids. My daughter reminds me of my childhood....not to mention she is the pickiest one I got. Omelet is something all 3 of them says "YES" to. It's a good way for me to sneak in some veggies they don't like. Mushroom is something they don't appreciate in their food. But I am hesitant to give up trying giving Mushroom to them. You guessed it right, I always try to sneak in mushrooms in the Omelet. They know Mommy is tricking them, but they eat them without much fuss because its hard to separate them from the Omelet which they love. The veggies in this recipes can be substituted with veggies of your choice. Use colorful vegetables like bell peppers rich in antioxidants and greens like spinach, which are not only appealing to eye but are packed with antioxidants and nutrients that are essential to give you a good start for the day ahead. You can also add ham, turkey or chicken if you prefer some meat in the omelet. This is a quick breakfast you can fix in the morning which is healthy and the same time filling too. The protein and calcium in the egg along with the healthy colorful vegetables makes it a complete breakfast. I am sure you will enjoy it. Whisk the eggs, milk, salt and pepper together till well blended. Take a small size non-stick frying pan and apply the cooking oil or cooking spray on it and place it on the stove with low heat. Once the pan is hot, pour half of the egg mixture into it and cover and cook for 1 minute. Add the half of the chopped vegetable on one side of the omelet and sprinkle pepper flakes, salt and ground pepper powder. Cover and cook for 2 - 3 minutes on low heat till the egg is not watery. Open the lid and sprinkle half of the cheese blend, approximately 2 tbsp of cheese on the vegetable mixture. With a non stick spatula gently lift the other side of the omelet and fold on to the side where the vegetables and cheese are and cook for 1 minute and remove from the pan. Repeat the above steps with the rest of the egg mixture and vegetables. Transfer the omelet to a plate and drizzle some ketchup or hot sauce over it and enjoy. You can substitute the vegetables with veggies of your choice. You can use cheddar cheese or Mexican cheese blend. 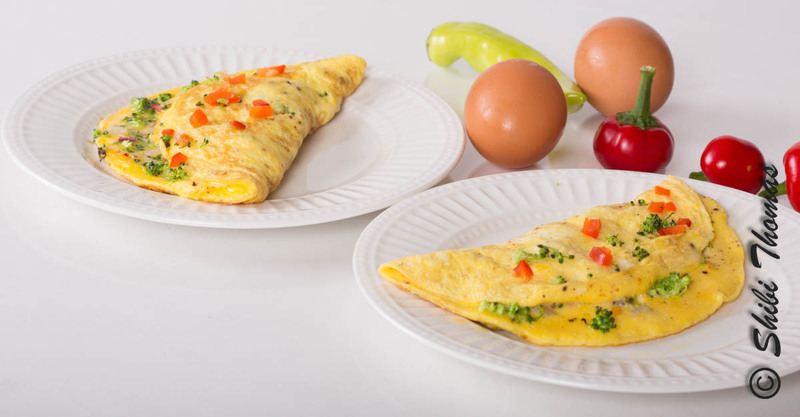 Slow cooking of the omelet gives it the soft texture and color without browning the omelet. Use a small non-stick pan so that you can easily fold the omelet. I used the milk in the omelet to make it soft and fluffy. You can increase or decrease the amount of cheese or completely skip the cheese if you are looking for a low fat diet. You can make a white omelet by excluding the yolk which makes it even lower fat ones. In that case you may need more egg whites to serve one person. Had the omelet for breakfast. And its good besides the point you sneaked in the mushrooms. I tried to post a comment from my phone earlier as soon as i saw this on facebook...so happy for you...great going...keep it up!!! Thanks Shema! Expecting your opinions and comments in the future posts. Shibi, so happy to see you here. I was thinking, I should come all the way there to taste all your wonderful recipes, now I can try myself too. Thanks for sharing, it will help a quiet a lot of working mums like you. You should have started this while we were in the hostel, survived only with pickles,thyru and Thursday's potato chips!! I do remember we made omelets once in a while in our room:) Keep going... May God bless you. Thanks Sujan for the encouragement!! Back in those days, Omelets & pickles were our surviror treats and I don't think I knew anything other than that. Thanks again dear!! !